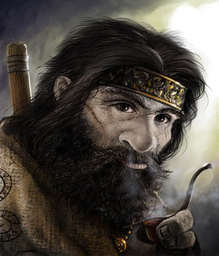 Male dwarven commoner 1: hps 5, AC 12. Thervain is a cranky old dwarf who runs the local lamp and lantern shop, Oil’s Well. He makes most of his lanterns and some of the oil he sells from a workshop at the back of his store. Gerran had a run-in with the old guy during an errand he ran for his mother. While Thervain went to the back of the store to fill Gerran’s order for a flask of papaya oil, Gerran noticed a lamp hanging near the ceiling of the shop amid a few dozen other lamps. This one, however, appeared to have something moving inside it, like a bevy of lightning bugs. When Thervain came back to the counter with Gerran’s order, Gerran asked the dwarf about the lamp. At that point, Thervain gabbed a long pole with a hook on the end and hooked the lantern with it. Scowling, he rudely shoved the lantern under the counter and told Gerran that the lamp was not for the likes of him. Just before the lamp was shoved under the counter, Gerran happened to notice a small screaming face pressed up against the glass from inside the lantern. Gerran asked how much the lantern cost and Thervain told him 250 gold coin.